Sepsis Treatment Still Lacks Rigorous Proof, Skeptics Say : Shots - Health News The bodywide inflammation known as sepsis kills about 300,000 people in U.S. hospitals each year. Promising treatments have come and gone, warn skeptical doctors, who call for rigorous research. 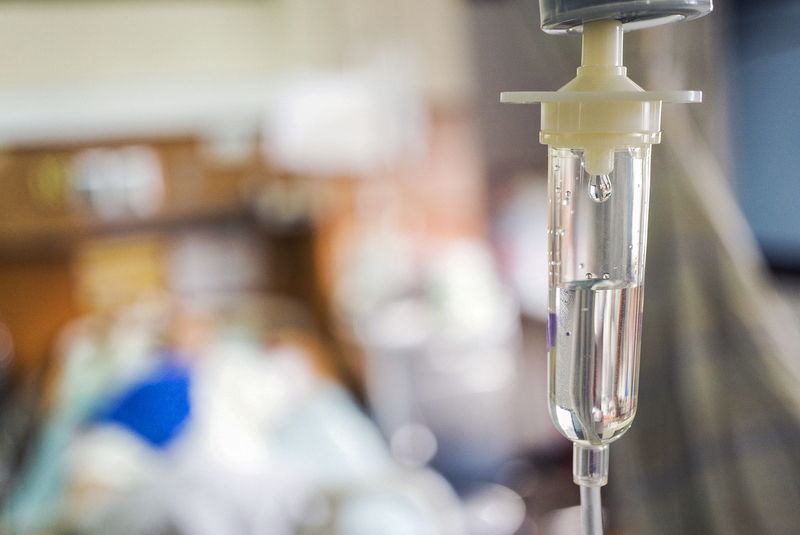 A well-regarded intensive care doctor in Virginia says he has had good success in treating 150 sepsis patients with a mix of IV corticosteroids, vitamin C and vitamin B, along with careful management of fluids. Other doctors want more proof — the sort that comes only via more rigorous tests. The astronomer Carl Sagan said that extraordinary claims require extraordinary evidence. Last week, a physician made the extraordinary claim that he had an effective treatment for sepsis, sometimes known as blood poisoning. Sepsis is a bodywide inflammation, usually triggered by infection, and the leading cause of death in hospitals, taking 300,000 lives a year. So, even a 15 percent improvement in survival would save 40,000 lives — the number of Americans who die on the highway each year, or from breast cancer. Dr. Paul Marik, a well-regarded intensive care physician at the Eastern Virginia Medical School in Norfolk, Va., is the doctor with the extraordinary claim. As we reported last week, he says he has treated about 150 patients with sepsis and that only one died of that often fatal condition (though some died of other causes). The question is how to find out whether he is right — and, ideally, how to do that quickly. Marik's treatment involves a mix of intravenous corticosteroids, vitamin C and vitamin B, along with careful management of fluids. And his experience, so far, falls far short of the "extraordinary evidence" that a claim like his requires. The first step in getting more evidence is to confront an appropriate skepticism that has grown up around purported treatments for sepsis. "Nothing has worked despite all the great ideas people have had, often ballyhooed with observational data like this, claiming that it's a big effect," says Dr. Robert Califf, who recently returned to Duke University after running the U.S. Food and Drug Administration. "So, I'd say the odds are still that it doesn't work," Califf says, "but every once in a while something works in an unexpected way." He wants to see solid evidence. In the world of medicine, that's a randomized controlled trial, in which patients are randomly assigned to get the experimental treatment or the standard of care, and neither patients nor medical personnel know who is getting what. An experiment like this should also be run at multiple hospitals. Considering how big an effect Marik is reporting, "it would take a very small study, done by people independent of him, to prove it," Califf says. "And then the whole world would benefit," whatever the results may be. But these trials don't happen overnight. There's no new drug to test, so pharmaceutical companies aren't interested. The National Institutes of Health, which funds many of these studies, would welcome a research proposal, says Sarah Dunsmore at NIGMS. But the experiment must be designed and approved by researchers first, she says, and then it would likely go into the standard nine-month review process, where it would compete for scarce funds with other research proposals. Califf just started a nonprofit called the People-Centered Clinical Research Foundation and says this is potentially a project the foundation could fund. Likewise the Society for Critical Care Medicine is interested in sponsoring a study to follow up on the research, says Dr. Craig Coopersmith, an Emory University professor of surgery and associate director of the medical school's critical care center. Even so, under the best-case scenario, results wouldn't be available from a randomized controlled trial for about two years. Some doctors aren't waiting. Dr. David Carlbom, medical director of the sepsis program at Harborview Medical Center in Seattle, heard Marik give a talk about his protocol and decided to offer it to his sepsis patients. Carlbom's impressions, after just five patients, are strictly impressionistic, not scientific, but he says some patients seem to have responded well. "I don't know if it's the medicine; maybe it's just us taking good care of them," he says. "Maybe it's them and their disease. But I was a little surprised. They did seem to heal faster from their septic shock." Carlbom says he is an early adopter. Other doctors who work in his hospital's intensive care unit are taking a "wait and see" approach. Of course, Carlbom is eager for scientific evidence as well. Dr. Mark Rumbak, a pulmonologist at the University of South Florida in Tampa, is also trying the protocol. Marik is an old friend, Rumbak says, so he heard about Marik's treatment months ago. So far, Rumbak has tried it on at least 30 patients, and most have done well, he says. "Not only do they do better; they do better quickly," he says. "Within 24 to 48 hours you see the patients responding. It's actually quite nice, it's quite dramatic." Some of the skepticism around this treatment has arisen because it includes vitamin C — which has been hailed repeatedly for its curative powers, though those claims have rarely been backed by solid science. In this case, Rumbak suspects that vitamin C is making the body more receptive to another part of the treatment — corticosteroids — which are well-established drugs. Dr. Berry Fowler, head of pulmonary disease at Virginia Commonwealth University's school of medicine, inspired Marik to use vitamin C in his hospital. Marik had heard about Fowler's experiments with IV vitamin C for sepsis and so started his own protocol with the mix of vitamins and steroids. Fowler is now running a controlled trial of vitamin C for sepsis, but his study does not include the corticosteroids or the vitamin B, which are part of the Marik protocol. Part of the challenge is that there is no agreed-upon treatment for sepsis. Doctors have different beliefs about how much fluid to give patients, which kinds of fluids to give, which kinds of antibiotics and whether to administer corticosteroids. So there is no established "standard care" to use as a clear point of comparison. Dr. Gordon Bernard, a pulmonary medicine and critical care specialist at the Vanderbilt University Medical Center, who has been studying sepsis for 30 years, is firmly in the skeptics' camp on this potential treatment. Bernard says wishful thinking might have led Marik to conclude that only one out of 150 of his patients has died of sepsis. "You could spend all day long adjudicating some of these cases, as to whether these people died of sepsis or something else," Bernard says. That question would get careful scrutiny in a randomized study. Yet scientists know there's also a danger in being too skeptical of extraordinary claims, because sometimes they do turn out to be true. In 1982, two scientists in Australia concluded that stomach ulcers are caused by a bacterium and could be treated successfully with antibiotics. It took well over a decade for doctors to believe it and start using that effective treatment. "We always have to be aware that every now and then something works," Califf says. "And we don't want to miss that opportunity." You can contact Richard Harris at rharris@npr.org.